The famous hand-painted bikes of Pink Floyd founder Syd Barrett will go under auction in November. The bikes will be on sale along with the rest of Barrett's last possessions in Cambridge, the city where the former singer spent much of his last 30 years. Barrett, who died in July, was often spotted out riding his bikes following his decision to avoid the limelight after quitting Pink Floyd in 1968. Other items up for auction include art by Barrett never before seen. There will also be a chance to buy the easel, paints and paint table which Syd used regularly to paint, various books, homemade speakers and a classical guitar. 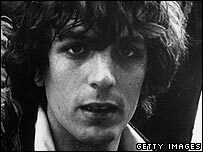 "Syd spent his last years living a quiet, yet content life in Cambridge," said a spokesman for auction house Cheffins. "Both his bikes, which he had used every day in Cambridge for visits to the local shops and pub, were hand-painted by Syd and will be included in this sale - as will several pieces of furniture which Syd customised or made himself. "He was passionate about, although not always competent at, DIY." The sale will take place on 29 and 30 November.